Step 1: Start putting into the wire a 6mm red crystal bead, a topaz crystal, a golden spacer, a 6mm red crystal bead, and again a 6mm topaz crystal. Using flat nose pliers, bend the piece of wire 90°, cut off the excess and bend the wire into a loop, insert your ear wire, and then close the loop tightly. 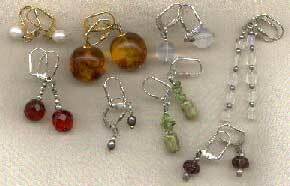 Step 2: Place in a piece of wire a 4mm red crystal bead, a 4mm topaz crystal, a golden spacer, and again one red crystal and one topaz bead, finish with a golden spacer. Bend the piece of wire 90°, cut the excess and bend the 3/16" piece of wire into a loop, insert your eye pin and close tightly.